Where Do Your Pets Sleep When You Go On Holiday? Leaving your cat or dogs at home is always hard when going away. You'll always ask yourself two alarming questions: Who would look after them and will they be safe? Luckily, our experienced team can provide the best care possible in our pet motel. We are experienced in dog training, rehabilitation and grooming. When you leave your animals in our care, we know that each of them have different needs. Our understanding of animal needs make it possible for us to meet your specific individual requirement. Leaving your pet is a difficult thing to do, but leaving them in the hands of a dedicated, loving and experienced duo is a smart thing to do. As a child, Lee would give up his lunch money to feed helpless animals on the street and even take them in and care for them at home. Fiona's story is not that different. She drove her parents crazy as she would take in many homeless animals, care from them and then find them a loving home. A Team You Can Trust: Fiona & Lee have over 20 years of experience in obedience training and Pet Grooming. This dynamic duo will not just look after your pets, they will care for them, love them, feed them and treat them as their own. Lee & Fiona also started an Animal Adoption Agency in 1999 with a very strict 'No Kill' policy. They have always been and are still today the voices of our furry friends. 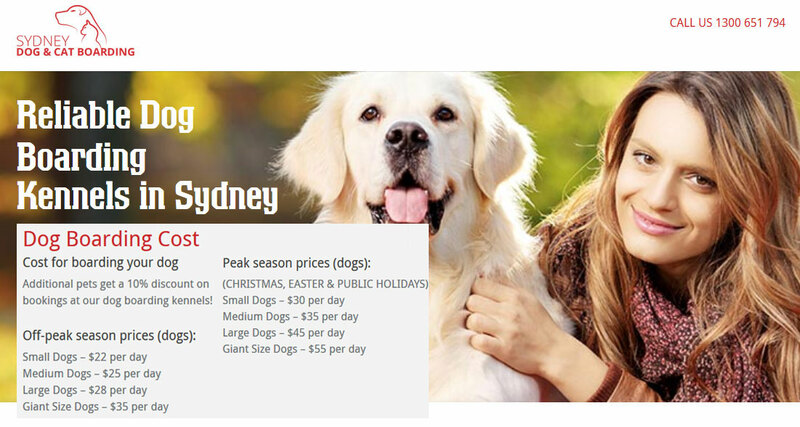 Your Pets Are In Good Hands: At Sydney Dog & Cat Boarding, we understand that each and every animal can have different personalities, therefore may have different needs. Our understanding of animal needs will make their stay enjoyable and pleasant. Sydney Dog & Cat Boarding strives to ensure their staff and themselves provide a positive, friendly environment for all the pets they care for.